(KU News Service) Groundwater levels during 2017, on average, rose slightly or nearly broke even in western Kansas, according to preliminary data compiled by the Kansas Geological Survey. The KGS — based at the University of Kansas — and the Division of Water Resources (DWR) of the Kansas Department of Agriculture annually measure levels in about 1,400 water wells in western and central Kansas. The collected data is used to monitor the condition and long-term trends of the High Plains aquifer, the state’s most valuable groundwater resource, as well as smaller deep and shallow aquifers. Water level changes or stability in the Ogallala aquifer in western Kansas correspond primarily with the amount of water withdrawn for irrigation, which in turn is influenced by the rate and timing of precipitation. Water level increases in western Kansas mainly occur when the levels in wells rebound as pumping slows. 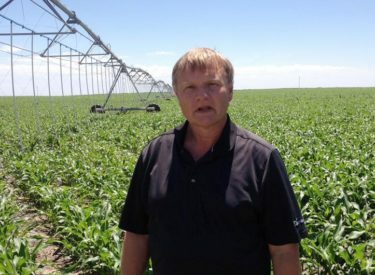 Recharge — water seeping down from the surface — is negligible in western Kansas. In central Kansas, where the aquifer is shallower and average precipitation is higher, recharge can make a difference. In southwest Kansas GMD 3, average levels dropped just 0.05 feet, the lowest decline there since since the state began administrating the water-level program in 1996. In comparison, the average level fell a total of 23 feet over the previous 10 years. Even with better overall measurement results in the region for the year, the aquifer is nearly depleted in places. Wells monitored in GMD 3 are drilled into the Ogallala aquifer except in a few areas where they draw from the deeper Dakota aquifer. The district includes all or part of Grant, Haskell, Gray, Finney, Stanton, Ford, Morton, Stevens, Seward, Hamilton, Kearny and Meade counties. Another rare water-related event in the region occurred in the summer of 2017, when the Arkansas River flowed in Garden City. The river here has been mainly dry for decades due to high water use and less river flow from Colorado. When there is surface water in the river, it interacts with groundwater in an adjacent shallow alluvial aquifer. Western Kansas GMD 1 experienced a slight drop of 0.19 feet in 2017 following a 0.55 feet in 2016. Although decreases there have been less drastic than farther south, annual levels have risen only twice since 1996. The GMD includes portions of Wallace, Greeley, Wichita, Scott and Lane counties, where the majority of wells are drilled into the Ogallala aquifer. Northwest Kansas GMD 4 had an average increase in water levels of 0.33 feet after falling slightly in all but two year since 1996. GMD 4 covers Sherman, Thomas, Sheridan and parts of Cheyenne, Rawlins, Decatur, Graham, Wallace, Logan and Gove counties. Groundwater there is pumped almost exclusively from the Ogallala aquifer and shallow alluvial sources associated with streams. The KGS measures approximately 570 wells in western Kansas each January, and DWR staff from field offices in Stockton, Garden City and Stafford measure about 220, 224 and 360 wells in western and central Kansas, respectively. Most of the wells, spread over 48 counties, are used for irrigation and have been measured for decades. Measurements are taken primarily in January, when water levels are least likely to fluctuate due to irrigation. Infrequently, however, later-than-normal pumping during dry conditions may affect measurement results.